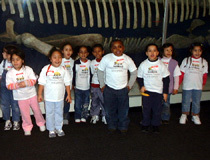 (1 trip with 32 four, five and six year olds) – A group of children from Salem, MA attended a field trip to the Harvard Museum of Natural History. The children attended the “Animal ABCs” Discovery Class where they became experts on how animals are alike and different. 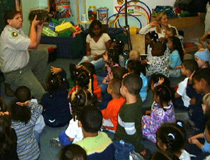 Instructed by one of Harvard University’s elite educators, the children learned about animals with and without backbones, by examining birds, reptiles, mammals, and amphibians. Three live animals also entertained the children during class! To complete the field trip, the children explored the treasures of the museum through all the stimulating exhibits. 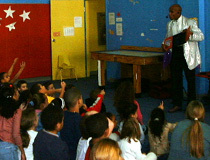 (1 Magic Show with 50 children) – A group of children from Salem Community Childcare Center took part in a special magic show featuring Bonaparte—“Boston’s Hottest Magician.” Bonaparte astounded and amazed the children with a unique blend of enchantment and comedy. His program featured a dramatic and mysterious appearance of a beautiful, fluttering white dove named "Snow" and Bonaparte's cuddly friend, "Winslow"-and adorable fuzzy bunny. The children had a fantastic time during the magic show and were able to share in a lot of laughter during their magical experience. (1 “In House Field Trip with 45--three, four and five year olds) – A group of children from Salem Community Childcare Center had an “In House Field Trip” with the “Rain Forest Reptile Show.” The Rain Forest Reptile Show is a program that teaches children respect not only for reptiles, but for all animals as well. During the program, the children learned about animal lifestyles and heard a lot of interesting facts and cool stories about reptiles. The movements and behavior of 4 live reptiles—a crocodile, snake, turtle, and lizard, entranced the children throughout the entire show. A lot of children were able to hold and pet the snake and crocodile, which was very exciting. (1 trip with 25 third, fourth and fifth graders) – A group of children from Salem, MA attended the Misery Island field trip. We started the trip on a boat called the “Island Star,” which took us to the island. Misery Island is a preserved island owned and operated by the Trustees of Reservations. At our arrival we were given a narrated walking tour by the island’s ranger. 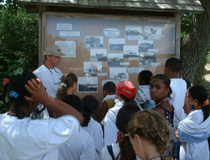 The children learned about the rich history of the island, and enjoyed exploring Misery’s nature trails. The children then enjoyed a beach side lunch, games of tag, swimming in the ocean, a scavenger hunt, and lastly a candy hunt. 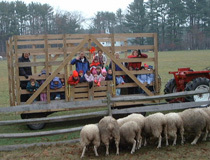 (1 trip in Dec. of 2001) - the children started their learning adventure by hopping into a hay wagon (which was attached to an old tractor) to have a hayride around the farm. Halfway through the ride, the tractor stopped at a hay barn. The children got out of the hay wagon to see where the hay is stored during the winter and to also pick up a bail of hay and a bucket of grain to later feed the animals inside the main barn. On the way back to the main barn, the tractor stopped again allowing the children to see a herd of sheep and a large group of cows grazing in the fields. When we returned to the main barn, half of the children went through the barn to visit with the animals (horses, hens, sheep, goats, and cows) and play in the hayloft, and the other half participated in decorating a Christmas tree and doing a crafts activity (making foam-like Snowmen). After lunch and a lot of excitement, the children went on a candy hunt outdoors, where they searched around trees and rocks for hidden pieces of candy. 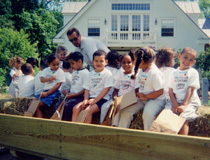 (1 trip in June of ’01) - the children started their learning adventure in a hay wagon attached to a big tractor. Throughout the hayride there were various stops where the children actively engaged in the farm by: apple picking at the apple orchard; watching the bees carry nectar to the beehive (where the children picked-up their honey sticks); seeing the cows and calves being fed (where the children picked-up a carton of milk); picking carrots from the vegetable garden; gathering eggs from the chicken coup; petting and feeding a horse in the main barn; and watching sheep and guinea hens wander around the farm. The field trip came to a close with an exciting candy hunt.